Sanrio must really be rich by now with their expanded merchandise. 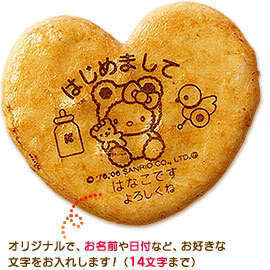 Aside from licensing a special Hello Kitty rifle, they now have special message osenbei (Japanese rice crackers. There are some sold here of which the most common brand is called Wan Wan)! Look at the stuff I bought when my and my spiritual hubby, Nagase Tomoya‘s phantom kid was born. The 5-piece pack costs 1,088 yen (tax included).